Known for its amazing strength, longevity, and toughness, Russian Birch is the top choice for furniture and flooring. 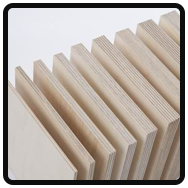 RPL International offers a wide range of imported plywood panels and plywood sizes that meet the needs of wood product manufacturers and distributors everywhere. Our selection includes the highest caliber of plywood available on the market today. Contact RPL International to receive a free quote for your next order of Russian plywood. Since 1969, RPL International has been the lead importer and distributor of Russian Birch plywood products in the United States. What sets us apart is our high level of service when it comes to supplying furniture and flooring grade plywood to manufacturers on time. As members of the International Wood Products Association™, National Wood Flooring Association™, and Forest Stewardship Council® (FSC-C014156), you may rest assured that all our plywood products are certified for durability and reliability. Ask about our FSC certified materials. With more than 40 years of experience in the field, our company has built a long-term relationship with manufacturers throughout the United States and Canada. We work to exceed your expectations with superior service whether you are a new or established client.